Student experiment soon on the ISS? Proposal by young geoscientists and physicists shortlisted. Their own experiment on the International Space Station (ISS) is the dream of many young early career researchers. For some geosciences and physics students at Goethe University Frankfurt this could soon becoming intriguing reality. They answered a call by the German Aerospace Center and entered their own project proposal in the area of zero gravity. A total of eight projects were selected from a large number of submissions. 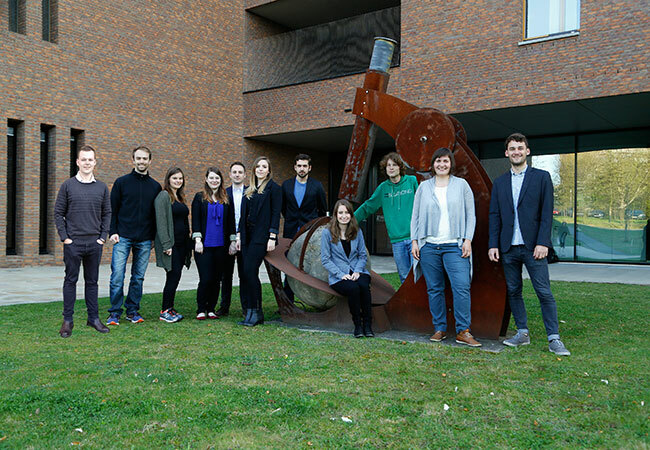 Three students from each project have now been invited by the centre in Bonn to present their concepts in person, including the EXCISS project of the student group in Frankfurt. EXCISS stands for Experiment on Chondrule Formation on the ISS. At the end of the selection procedure, German astronaut Alexander Gerst will take three experiments with him to the International Space Centre and conduct them there. “What we want to solve with this experiment is nothing less than the origin of the most common solid objects in the early solar system”, reports group leader Tamara Koch. When our solar system was born about 4.56 billion years ago, the solar nebula was composed of gas and dust particles. These were made up either of calcium and aluminum-rich minerals or iron and magnesium-rich silicates. By means of a process as yet unexplained, these were suddenly heated up to several thousand degrees in the early phase of the solar system, only to solidify equally suddenly in droplet form, what are known as chondrules. This process has left researchers baffled up until today. There are several hypotheses. For example, shock waves or flashes of lightning could have heated up the dust particles to such a high temperature. Another possibility could be a collision between asteroids. None of the three hypotheses has so far won through. The students want to examine now in the framework of the EXCISS project whether the chondrules in the dust-gas mix of the solar nebula could have evolved through high-energy lightning. The focus is on the iron and magnesium-rich silicates. “Carrying out such a project in a small box of less than 15 centimeters edge length and with a 2-volt electricity supply is certainly a challenge”, says Yannik Schaper, who together with his fellow students is taking care of the physics side of the project. “Only through close cooperation between geoscientists and physicists can the project be put into practice successfully”, explains Frank Brenker, Professor for Nanogeoscience and project initiator. “The students have done a great job here and produced a sound concept in a very short time frame. That’s why we weren’t really surprised to be among the last eight”, he reports. The group is now eagerly awaiting the meeting in Bonn and hopes to be one of the three projects which is awarded funding and ultimately flies to the ISS. The project is supported by the working groups on Nanogeoscience (Professor Frank Brenker) and Crystallography (Professor Björn Winkler) as well as by the glassblowing workshop of the Department of Chemistry at Goethe University Frankfurt (Michael Röder). Sponsors willing to give the project their financial support are greatly welcomed.